These posters were produced by Polish artists in order to advertise American movies in Poland. The works are the result of a clash of two cultures - that of Hollywood and Polish culture. 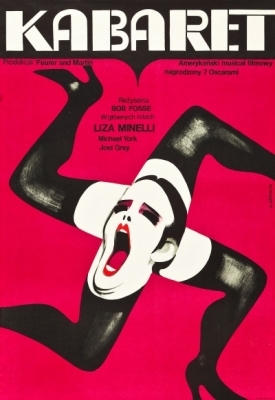 As the power in the Communist regime was centralised, Polish graphic artists were ordered to create posters to foreign movies, and though these artists were isolated from the rest of the world, and often they were not given an opportunity to watch a film prior to making a poster, they were still able to create original and unconventional images. They had to rely on their own imagination and their own vision of the West. All these conditions helped to create a unique style, which caused sensation all over the world. These works were distinct from those produced in the US; they were very pictorial, metaphorical, often composed of simple graphic forms. Lack of pictures and ready-made patterns provided by film producers, the absence of characters' pictures and the use of handwriting descriptions closely connected with the images as well as an individual style of each of the artists made these works, emerging from behind the Iron Curtain, very exceptional. The exhibition presents several dozen of posters created by such posters artists as Jakub Erol, Mieczysław Wasilewski and Halina Bodnar.